Blizzard has shared more information about the Coldlight Surfrunner, one of the pets required for the I'm Here for the Pets achievement. There are different Murloc tribes in Azeroth, and so far, the kind of Murlocs that could drop Coldlight Surfrunner have not appeared on Island Expeditions. After our earlier tweet, we are working on a hotfix so that the Coldlight Surfrunner can drop when ANY murloc type is present on an Island Expedition. Furthermore, we're simplifying this entire system in Tides of Vengeance. More details on that soon. We have now updated our Island Expeditions Rewards Guide with this new info, as well as updated items related to Tol’vir, Twilight Dragons and Old Gods, which were recently added as possible invaders in Island Expeditions. Two new islands - Havenswood and Jorundall - are coming to Island Expeditions in Tides of Vengeance. In addition to that, we are getting two new events - Azerite Ruptures and Azerite Extractors - in which you use devices to collect Azerite. The Island Expeditions Gameplay is also receiving an update, invasions will have more variety (you may face Southsea Pirates and Earth Elementals on the same island), but you may also run into an island full of the same creatures. Prepare to set sail for two new islands—Havenswood and Jorundall—coming to Island Expeditions in Tides of Vengeance. Along with two new islands to explore, we’re also adding two new events that heroes might encounter on islands across the Great Sea. Azerite Ruptures – Upon encountering an Azerite Ruptures, you deploy a device to collect it, which will summon waves of Azerite-themed enemies several times before drawing out a rare or rare elite enemy. As these are Azerite-themed creatures, they’re a bit more lucrative than the usual island natives. You’ll also need to be ready to face more than just the creatures summoned by the device—each time this is activated, a map-wide announcement is made alerting the enemy team of the location. Azerite Extractors – Once you’ve discovered an Azerite Extractors location, you can deploy an extractor which will grant your team Azerite over time. However, this extractor can be overtaken easily by the enemy team; it also draws the attention of nearby NPCs. Once an extractor is deployed by a faction, all players will learn about the extractor's location immediately, so watch out for unexpected guests! Since the launch of Battle for Azeroth, we’ve continued to iterate on Island Expeditions. In Tides of Vengeance, we’ve tried to shake things up with the addition of Azerite Ruptures and Extractors, add a bit more variety to what you can expect on any given island. You may encounter one of these in place of an invasion, and even invasions will have more variety—for example, you may face Southsea Pirates and Earth Elementals on an upcoming island visit. We’ve also worked to cluster NPC enemies that inhabit the islands closer together, giving you a bit more space between points of interest (map space permitting), so spawns should feel a bit more organic to the island you’re on. With these changes, we’re looking to increase replayability and create more unique encounters each time you return. This doesn’t mean you won’t ever see an Azerite Invasion again, but it should no longer be something you encounter every Island Expedition. Perhaps you’ll run into an island that spawns so many giants it becomes a giant-killing-fest. . . . If you’ve never taken part in an Island Expedition, there’s no better time to sail into the action. Why We Fight: Azerite is seeping up from the wound that Sargeras’ blade dealt to Azeroth, and an incredible new resource is waiting to be claimed by the Horde, the Alliance, and anyone else seeking power. When you set out on an Island Expedition, you’ll compete for this resource to empower your Heart of Azeroth and to aid your faction in the race to control as much of the world’s Azerite as possible. Your Mission: You’ll queue for Normal, Heroic, Mythic, or PvP difficulties either alone or with a group by using an Expedition table in Zuldazar Harbor (Horde) or Boralus Harbor (Alliance). Island Expeditions are three-player encounters, and while you can play as any mix of roles, you’ll want to make sure you’re coordinating with the rest of your group to overcome the opposing faction and acquire 6,000 Azerite before they do. Upon landing on the Island, you’ll disembark from your ship and make your way onto land in search of as much Azerite as you can get your hands on. There are many ways to acquire it, whether it’s by killing monsters, finding treasure chests, defeating the opposing faction’s team, or mining the nodes that will appear around the island. The Landscape: There’s plenty to explore on this uncharted land, and each island features lots of dynamically generated elements that provide a variety of challenges to overcome. It’s more than just the Horde and the Alliance interested in the Azerite—you’ll also confront a wide range of different enemies seeking to claim it for their own. As you explore the island, you’ll engage in smaller encounters such as a village of quilboar, water elementals guarding treasure chests full of Azerite, or rare and elite monsters. You’ll also encounter random events from time to time as you explore the island. To overcome some of these encounters, you’ll need to keep an eye out for beneficial shrines, food, or objects that can aid you. With a bit of tactics and coordination, you’re bound to find some great opportunities to add more Azerite to your count and claim victory. With extensive combinations of enemies, power-ups, spawn locations, and more, you’ll never know what you’ll come across in your next Island Expedition. Your Opponents: You won’t be alone on the island, as much as you might hope to be. 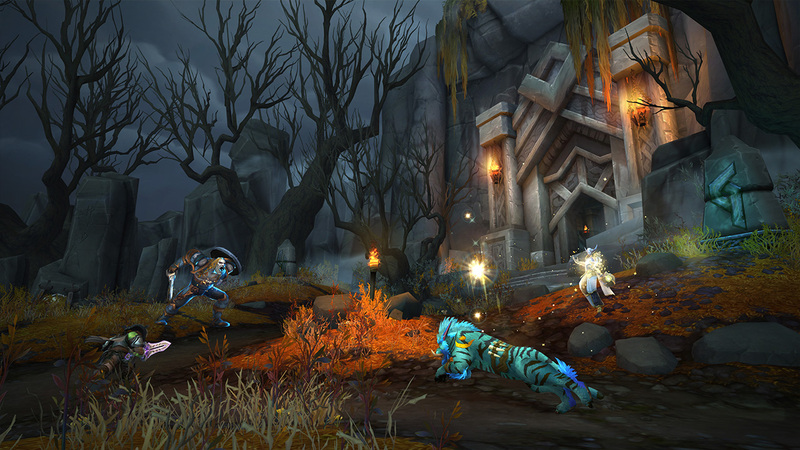 There are others who want to get their hands on the Azerite, and queuing for Normal, Heroic, or Mythic difficulty will pit you against a rival team of three Horde or Alliance “Advanced NPCs.” These clever rivals will move around and take advantage of the island just like other players would, and each group of opponents has different tactical personalities, from the more aggressive to the more defensive, and will all seeking to claim 6,000 Azerite before you can and take home victory. You never know which team of opponents you’ll face, so be prepared to use all your character’s abilities to overcome them. For those who choose PvP difficulty, you’ll be pitted against players of the opposing faction to see which team will triumph. New adventures await in Tides of Vengeance which makes landfall, December 11, 2018. The Sabertron World Quest is now up on EU and US, allowing players to tame the Orange Sabertron and get it as a pet, or slay it for the Sabertron Assemble achievement. Sabertron is by default red, but it changes colors depending on if the world quest Sabertron is up, spawning as a new color every quest. The colors are Red, Yellow, Green, Orange and Copper. Pilgrim’s Bounty begins today! Even as war rages between the Horde and the Alliance, there’s still an abundance of good fortune to celebrate during Pilgrim’s Bounty. Combine this buff with the Celebration Package to get 24% increased reputation, which is great to unlock the Mag'har Orcs and the Dark Iron Dwarves Allied Races! Click here for the Pilgrim's Bounty Guide! WoW's 14th Anniversary has started! New to this year are the Overtuned Corgi Goggles which you can purchase for 200 Timewarped Badges. This toy will make all friendly NPCs appear as corgis, which can lead to some pretty funny moments. Check your mailbox for the Anniversary Gift! Inside the package you will find 200 Timewarped Badges and a Celebration Package. Historian Llore and Historian Ju'pa have daily quests that reward you with more badges, and several items from previous events for sale such as Exquisite Costume Set: "Edwin VanCleef", Corgi Pup, Bronze-Tinted Sunglasses and Inflatable Thunderfury, Blessed Blade of the Windseeker. The Dragons of Nightmare, Azuregos and Lord Kazzak have returned! They are on a daily lockout and drop 350 ilvl gear, which is great for new 120 characters. Inside the package you’ll find 200 Timewarped Badges, a Celebration Package item to increase experience and reputation gains by 14% for 1 hour, and a “Letter from the Timewalkers,” which will start a new quest leading you to either Orgrimmar or Stormwind. In addition, questgivers Historian Llore and Historian Ju’pa will have two daily quests that give players a chance to earn additional Timewarped Badges either by answering World of Warcraft trivia or by defeating some familiar foes. Collectors will also have a chance to pick up a few pieces of classic loot from defeating them. Players level 1–59 who didn’t get to complete last year’s letter from the Timewalker’s quest will still be able to receive and complete it. It’s been 14 years since gates opened into Azeroth and the heroes of the Horde and Alliance began their journey of discovery and adventure. To celebrate this momentous occasion, some familiar foes have returned to Azeroth—with some slightly updated abilities. Players level 60 and above can take on Lord Kazzak, Azuregos, and one of the four Dragons of Nightmare each day for some loot and 50 Timewarped Badges. In addition to all the many great items available for purchase, you’ll be able to use your badges to acquire a new item this year. New Toy! Overtuned Corgi Goggles: Change how you see the world around you when you use this new toy. While active, friendly NPCs will appear to be such good boys and girls all year round. Thank you to everyone who’s been a part of this adventure so far. You represent the best aspects of the Horde and the Alliance, and you inspire and motivate us every day. We’re looking forward to sharing many, many more adventures with you in the years to come. 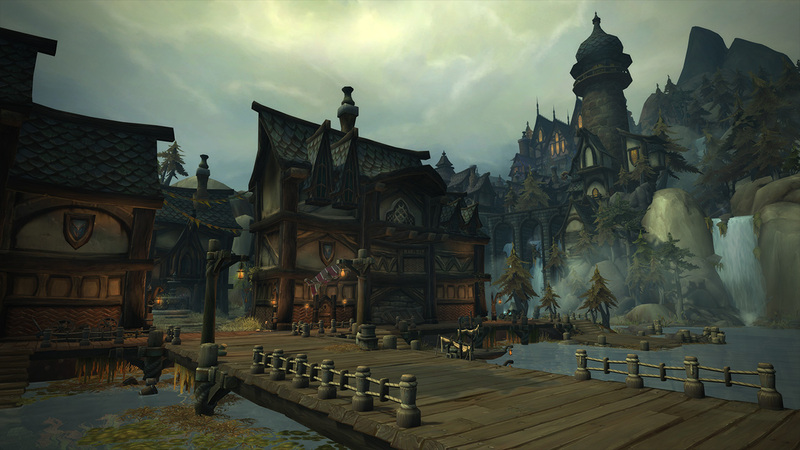 At the end of the Immersive Sounds of Azeroth panel at Blizzcon, Blizzard's Sound Team revealed that there is a secret in Waycrest Manor. If you're into secrets I think it's worth noting here today that Lady Waycrest has offered tribute and is waiting for you to find a little musical surprise. Members from the Secret Finding Discord were quick to react to this and found the secret within a day! Thanks to Deity, Not a dreadlord, Padwarle, Aerinis and everyone else for figuring out how to trigger the secret. Throughout Waycrest Manor there are multiple pipe organs afflicted by drust magic. You will have to dissipate the magic by defeating the witch that spawns when you approach the organs. Upon doing so Lady Waycrest becomes angry and slams her hands on the keyboard, playing a discord chord. After you have defeated all 5 witches, clear the rest of the instance then return to "The Grand Foyer" at the entrance. Wait a few minutes and music similar to music from other Blizzard games will start playing! The music will play and loop in the order of the 6 tracks that you can preview here. The organ sounds are references to music from other Blizzard games.